There's been a lot of great Star Wars LEGO over the years, but these two new sets, both based on the opening of Return of the Jedi, are my new favourites. The first set is Jabba's Palace ($120). 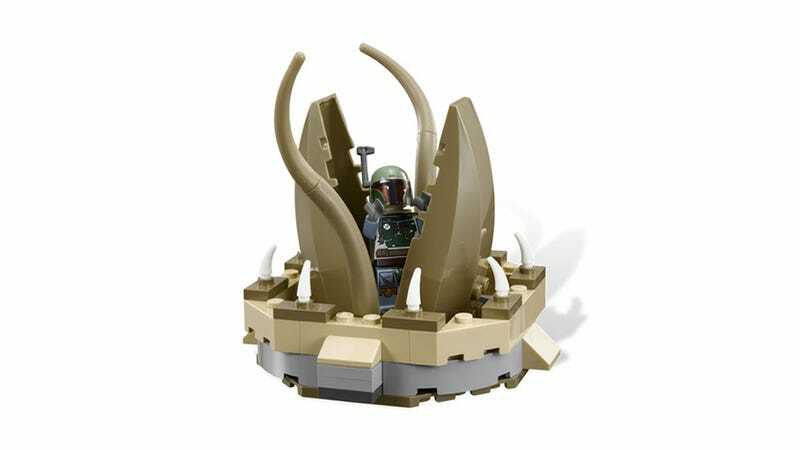 It not only has a moving throne platform, for trapping Luke beneath while he sticks bones in a stupid animal's mouth, but also a carbonite-frozen Han Solo (who can pop out and become Blind Han Solo) and even a minifig of one of the coolest characters in the entire Star Wars universe, a B'omarr Monk. The second set is called "Desert Skiff" ($25), an exercise in understatement if ever I've seen it, because the star is really the LEGO Sarlacc pit, which can gobble up the little Boba Fett that comes with it. Both sets will be out in September.